Can I integrate your Contact forms in homepages from any host provider ? Currently I am setting up homepages from two different host provider, namely 1 + 1 (Germany) and Network Solutions (USA). I am wondering whether your fom work on either of those accounts in an interactive way if a homepage visitor is using it & clikcks on the submit button. This brings me to me second and last question: I translated one of your contact forms into German language. 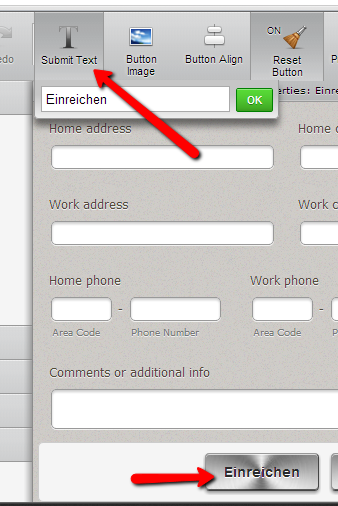 However, I can't edit the submit button into Germany language. Any hint would be appreciated. I am not quite sure I got the idea on your first inquiry, did you mean to ask if you can embed a single form (1 only), on your website which is hosted on 2 different location? If you embed a form, even it if is many instances on different website, the resulting submissions/database will be the same for all. As long as it is the same form, if you deploy it 10x, the resulting submissions of all the forms will be in JotForm database for that 1 form only.